(PRESS RELEASE) NEW YORK – Essilor of America announced today the launch of AVA (Advanced Vision Accuracy), an integrated solution for eye care professionals enabled by the introduction of the new phoropter, the Vision-R 800 by Essilor Instruments. For the first time, this integrated offer will include breakthrough refraction technology, innovative user-friendly intelligence and premium advanced lenses which will give eye care professionals the ability to demonstrate and deliver the best vision possible for patients. “At Essilor we are committed to giving eye care professionals an opportunity to differentiate themselves and their practices with our cutting-edge technology and revolutionary patient care solutions,” says Rick Gadd, president of Essilor of America. The new phoropter, the Vision-R 800, introduced by Essilor Instruments, represents a major advancement in refraction techniques, which have remained unchanged for nearly a century. This new advanced phoropter introduces a whole new standard of accuracy while maintaining an efficient and consistent refraction. 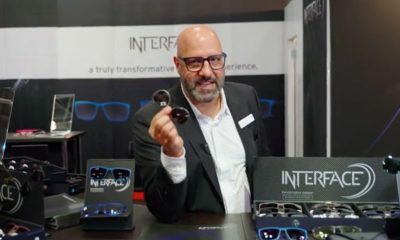 “The Vision- R 800 phoropter is a perfect example of what Essilor does best: innovating to improve lives by improving sight,” says Samy Lauriette, senior vice president, Essilor Instruments Americas. The Vision-R 800’s patented optical module allows for instant focus and exact refraction. It offers a refractive power of 0.01D steps and instantaneous changes of sphere, cylinder and axis at the same time for unparalleled accuracy. The precise Rx will be delivered through our best digital lens designs – Varilux® and Eyezen+, which will be available to be ordered to 0.01D in the second quarter of this year. The result is patients get the full potential of their vision. With the Vision-R 800, the refraction experience is transformed – for both the patient and the practitioner. The practitioner reaches the final refraction more quickly than with traditional methods thanks to the continuous and simultaneous changes of sphere power, cylinder axis and cylinder power. Also, the module’s “Smart Tests” algorithm assists the specialist in conducting the refraction procedure, making it both fast and easy, allowing the practitioner to focus on having a dialogue with the patient. The Vision-R 800 uses a revolutionary new liquid lens and a new refractive process that makes the experience more comfortable for the patient and less tedious for the doctor. The phoropter’s smooth power changes and wider field of vision allow for a shorter procedure with less fatigue for the patient and doctor. At the end of the test, the Vision-R 800 phoropter offers patients the experience of comparing refractions in simulated real life conditions.